Vacation rental house. Sleeps 16, 6 bedrooms, 4 bathrooms. No pets allowed. Walking up to the lovely Hal-Sea-On. 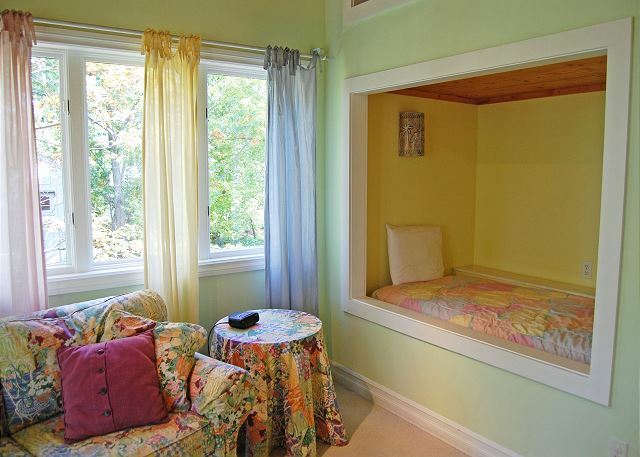 Hal-Sea-On, located in a private cul-de-sac right in the heart of Glen Arbor. 60 feet of lake frontage on Lake Michigan in Sleeping Bear Bay, shared with private cul-de-sac residents. Deck with lake view and basketball hoop. Looking towards the cul-de-sac of homes. Hal-Sea-On is beyond that big pine! The path to the beach at the end of the cul-de-sac. Looking towards the water in the cul-de-sac in front of the home. Walking into the family room with its cozy fireplace. Looking from the main dining table into the living room. Notice the pot rack full of supplies, and the kitchen counter pass through! Looking from the dining area towards the entryway and living area. The living room is just off the split level entryway. The main kitchen includes dishes and flatware, wine glasses, all cooking, baking and serving supplies, refrigerator, electric stove and oven, dishwasher, microwave, toaster, blender, hand held mixer, coffee maker, 6-qt. crockpot, electric fry pan, variety of spices. 2nd kitchen has service for 8, full size refrigerator, gas stove (no oven in the 2nd kitchen) microwave, and coffee maker. Refrigerators in both kitchens are full size; main kitchen refrigerator has the freezer on the bottom and the refrigerator in the second kitchen is a side-by-side. Microwaves are located in both kitchens. Dishwasher is located in the main kitchen. Service for 20 in the main kitchen; service for 8 in the second kitchen. Coffee makers are located in both kitchens. The kitchen pantry area with dishes, glasses, and serving bowls. The screened in porch off the dining room. The first bedroom on the main floor with king bed and attached bath. The attached master bathroom with custom tile work. 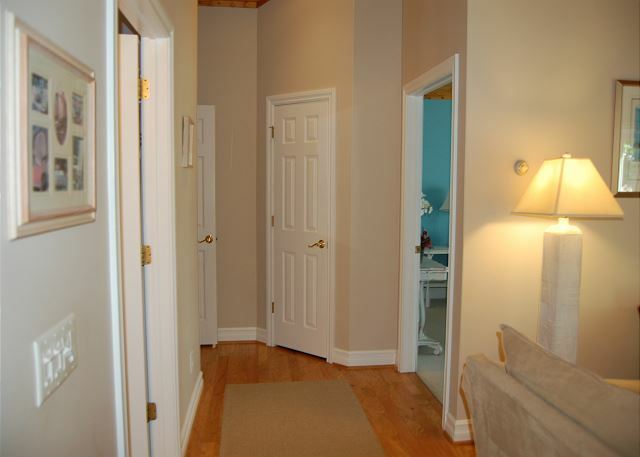 The hallway on the main floor, leading to the attached suite apartment. A wall of bookshelves and lovely reading nook just across from it. The reading nook just across from the hallway of books. The apartment living room, which is just off the main floor. Separate living area and fireplace in the apartment area. The hallway of the guest apartment (attached to the main floor of the home). There's a bedroom on the right, and a bathroom on the left. The second bedroom on the main floor with a seating area and built in bunks. The second bedroom on the main floor. 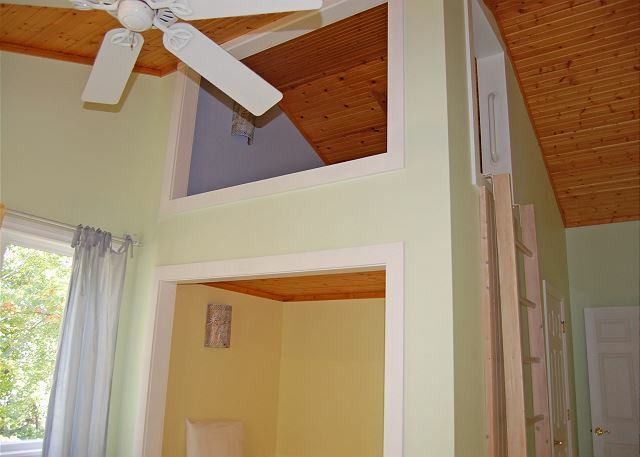 The second bedroom on the main floor with lofted beds. The hallway bath for the first floor. The first bedroom in the lower level with king bed. The shared hallway bathroom with stall shower in the lower level. The second bedroom in the lower level. The third bedroom in the lower level with four built in bunks (the other two are across the room and in the next picture). The shuffleboard table in the lower level. 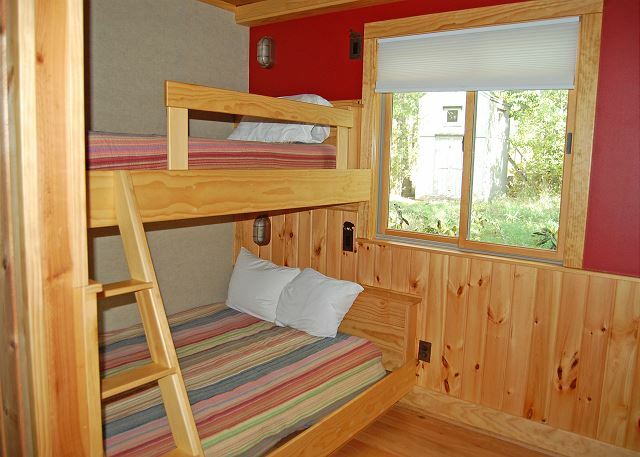 The second set of built in bunks. 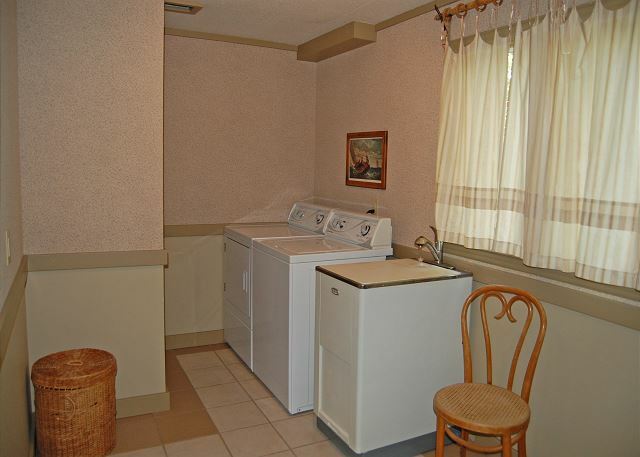 The laundry room in the lower level. Shared frontage on Lake Michigan, located in Glen Arbor. Six bedrooms/Four baths. Accommodates 16. King bed in master bedroom; Queen bed in second bedroom; King bed in third bedroom; One set of full/twin bunk beds and twin sofa sleeper in fourth bedroom; Full bed in fifth bedroom; Two built-in twin beds plus one full/twin built-in bunk bed in sixth bedroom. Two kitchens; Two living rooms; Two fireplaces; Wireless and high speed internet; No phone land line; Washer/Dryer. Linens and towels provided. Nonsmoking. 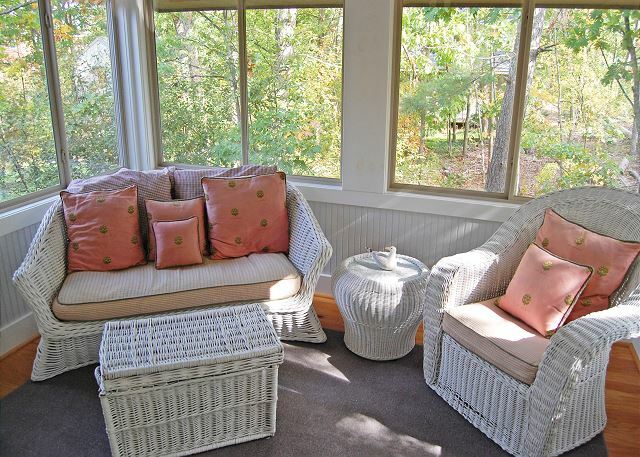 Screened porch; Deck with lake view; Deck furniture; Gas grill; Outdoor shower; Four kayaks available; 60 feet of lake frontage on Sleeping Bear Bay, shared with private cul-de-sac residents. PARKING FOR A MAXIMUM OF 4 CARS. Summer rentals are Sunday to Sunday. Hal-Sea-On House is perfectly located and can accommodate a group; the home is situated on a private road in the village of Glen Arbor and shares a private beach on Lake Michigan. The main dining area seats 14. For added convenience when returning from the beach, there is a fully enclosed outdoor shower with hot and cold running water and a separate foot wash. During the summer season the light is visible from the South Manitou lighthouse and large freighters are often seen travelling through the Manitou passage. There are no bluffs or stairs to reach the beach; the beach is fine white sand as is the gently sloping lake bottom. Four kayaks and accompanying life vests are available for your enjoyment. There is a new basketball backstop in the driveway. Walk in the opposite direction from the lake and 3 minutes brings you into the heart of quaint Glen Arbor to enjoy locally-owned restaurants that range from casual to fine dining, organic to gourmet pizza. The new Sleeping Bear Heritage Trail is a 3 minute bike ride from your front door; bicycles can be rented in Glen Arbor. Galleries featuring local artists, specialty shops, mini golf, kayaking the lazy Crystal River, bicycle rental, tennis courts, a winery, legendary Art’s Tavern, and Cherry Republic - the world’s largest retailer of American cherry products - are all steps from your front door. Several golf courses are within a 15 minute drive, as is downhill and cross country skiing. There are 24 wineries located throughout the Leelanau Peninsula for tours and tastings, as well as a casino (30 min), 140-year-old Leland Fishtown for fresh and smoked Lake Michigan fish, an historic lighthouse at the tip of the peninsula in the Leelanau State Park (45 min), and a restored Coast Guard station and lighthouse in Glen Haven (5 min). A 10 min. drive will bring you to marinas on Glen Lake where you can rent a boat and tour the beautiful Glen Lakes. Festivals, celebrations and tours occur throughout the year in Glen Arbor and surrounding communities. Glen Arbor is in the heart of the Sleeping Bear Dunes National Lakeshore Park which provides opportunities for hiking on your own or hikes guided by the National Park Service or the Leelanau Conservancy. The National Park Service provides snow-shoe lessons and free snow-shoe rentals during the winter. Snowshoes and cross country skis and supplies are available in Glen Arbor for winter sports along the new Sleeping Bear Heritage Trail. The 400 foot Sleeping Bear Dune is easily accessible and offers magnificent views of the bay. Visit the dune climb and climb the face of a 150 foot dune located 5 minutes from Glen Arbor. Every season is a wonder in this National Park from the cherry blossoms and fresh produce in the spring, the miles of white sand beaches and outdoor activities in the summer, the majestic colors and festivals in the fall, and the softness and beauty of wintertime. While all the activities and amenities in Glen Arbor are just around the corner from your front door at Hal-Sea-On House, the home’s location is secluded and away from the hustle and bustle of town. The only sounds are the waves lapping the shore, the breeze in the pines, and the laughter of guests enjoying their vacation “up north”.